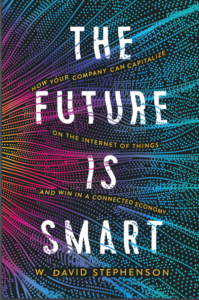 This is the first of an occasional series of posts preceding the August 1st publication of The Future Is Smart. The book will introduce the Internet of Things to business audiences and help them create affordable, profitable strategies to revolutionize their products, services, and even their very way of doing business through the IoT. Each post will excerpt part of the book, giving you enough detail to be informative, but not — LOL — complete enough that you’ll be able to skip buying the book itself! The critical point the book makes about revising your products and services to capitalize on the IoT is that it’s not enough to simply install sensors and beef up your data analysis: equally important are fundamental attitudinal shifts to break free from the limits of past technology and realize the IoT’s full capability. A critical component is what I call “Collective Blindness,” a way of describing how limited we were in understanding how products actually ran in the era when we had almost no data about their operations, let alone real-time data that we (or other machines, through M2M controls) could act on instantly to create feedback loops and improve operating precision and facilitate upgrades. Let me know what you think (after an horrific hack, I’ve decided to scrap comments on the blog — if I think it’s merited, I’ll feature your feedback in future posts)! Technologist Jeffrey Conklin has written of “wicked problems” that are so complex they aren’t even known or detailed until solutions to them are found. What if there had been a wicked problem, a universal human malady that we’ll call “Collective Blindness,” whose symptoms were that we humans simply could not see much of what was happening in the material world? We could only see the surface of these things, while their interiors and actual operations were impenetrable to us. For millennia we just came up with coping mechanisms to work around the problem of not being able to peer inside things, which we accepted as reality. Collective Blindness was a stupendous obstacle to full realization of a whole range of human and business activities. But, of course, we couldn’t quantify the problem’s impact because we weren’t even aware that it existed. In fact, Collective Blindness has been a reality, because vast areas of our daily reality have been unknowable and we have accepted those limits as a condition of reality. We couldn’t tell when a key piece of machinery was going to fail due to metal fatigue. 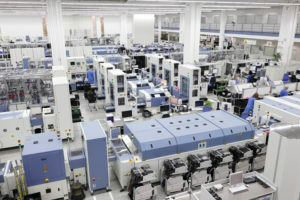 We couldn’t tell how efficiently an assembly line was operating, or how to fully optimize its performance by having changes in one machine trigger adjustments in the next one. We couldn’t tell whether or when a delivery truck would be stuck in traffic, or for how long. We couldn’t tell exactly when we’d need a parts resupply shipment from a supplier. (Let’s be honest: What we’ve called “just-in-time” in the past was hopelessly inexact compared to what we’ll be able to do in the future.) Nor would the supplier know exactly when to do a new production run in order to be ready. We couldn’t tell how customers actually used our products once they were in the field, or help those customers adjust operations to make them more efficient. The wicked problem of Collective Blindness is ending, because the Internet of Things solves it, giving us real-time information about what’s happening inside things. The Internet of Things will affect and improve every aspect of business, because it will allow us to eliminate all of those blind spots resulting from Collective Blindness, achieve efficiency, and derive insights that were impossible before. 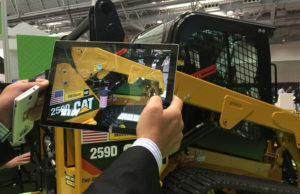 PTC has created the most literal cure for Collective Blindness: Vuforia, an AR system that lets an operator or repair person wearing an AR headset or using a tablet to go from looking at the exterior of a Caterpillar front-end loader to “seeing” an exploded view of the system that shows each part and how they connect as well as monitoring the realtime performance data of each component, gathered by sensors on the machinery. That insight can also be shared, in real-time, by others who need it. You may quibble with my choice of the “Collective Blindness” metaphor for the obstacles we and businesses in general, faced before the IoT, but I do think we need some sweeping description of exactly how limited we used to be because the acceptance of those limits, and our inability to “see” how things really did restrict our ability to fine-tone products and their operation — and even now may keep us from re-examining everything now that we have gained this ability. Let me know your thoughts on this — and I hope you’ll stay tuned for more excerpts from The Future Is Smart in coming months.